By Laura Kostelny | 7 years ago Designer Juilo Quinones extends an invitation to step into his home. By D Magazine | 7 years ago Unleash your inner Francophile with our editors' picks. By D Magazine | 7 years ago These 90 top local companies were selected by their peers. By Peggy Levinson | 7 years ago Designer Barbara Vessels brings her touch to a couple's empty nest. By D Magazine | 7 years ago Want to bring a taste of France to your place? We’ve done the heavy lifting and put together a list of must-haves. By Kristy Alpert | 7 years ago At the downtown Carrollton shop no good material goes to waste. By Joslyn Taylor | 7 years ago There's more room for home decor thanks to the new Highland Park Village spot. By D Magazine | 7 years ago A $9.9 million Preston Hollow home where your family can live like it belongs in the movies. By Perry Levinson | 7 years ago Editor-at-Large Peggy Levinson talks spicy colors, George Cameron Nash, and Van Cliburn. By Joslyn Taylor | 7 years ago The much-loved Lovers Lane shop makes a move. By D Magazine | 7 years ago Four or five bedrooms in North Dallas or Highland Park. 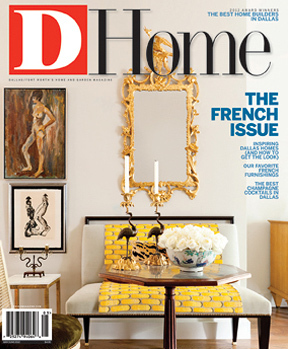 By D Magazine | 7 years ago A 1953 ranch-style, a 1964 traditional, or a home in Vickery Place. By D Magazine | 7 years ago A home in Preston Hollow, Bent Tree, or Gaston Place. By Joslyn Taylor | 7 years ago His eponymous store opens on McKinney Avenue. By Dawn McMullan | 7 years ago Make yourself at home in this historic Dallas neighborhood.